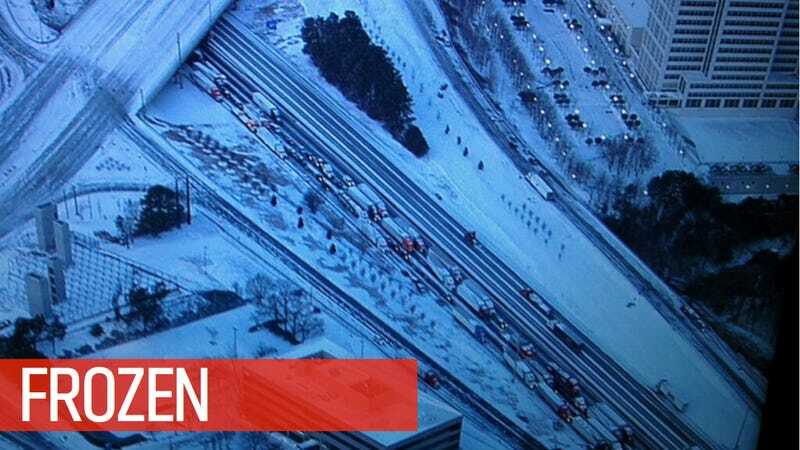 Winter weather has left the City of Atlanta and surrounding areas, already prone to gridlock, in a condition of almost historic transportation disfunction as the infrastructure designed to keep the roads clear has failed at almost every step. Students are trapped in schools, thousands of motorists are trapped in cars, and the governor is sending in the National Guard. Yesterday's rush hour is entering its 18th hour as people still haven't made it home. The Atlanta Journal Constitution reports that students who needed a bus to get home are sleeping in gyms and motorists have abandoned their cars by the hundreds to sleep wherever they can find shelter, including churches and the aisles of grocery stores. This isn't surprising to us given that we named the city the second least-prepared for winter earlier this month. Making matters worse, the trucks from the Georgia Department of Transportation [GDOT] are battling the same traffic and ice that everyone else is and can't get to where they need to clear the roads. As WSB-TV pilot/photographer Jason Durden explains, it's a "nightmare" situation with thousands of people stuck in the ice. "[GDOT] can't get to areas to clear ice/snow due to severe traffic and abandoned cars," he tweeted this morning. Whereas the infrastructure has largely failed motorists in Atlanta, the people of the city have stepped up with thousands using a Facebook page to share information and help give shelter to people stranded on the highways. Are you or anyone you know in Atlanta right now? Share your stories below.